Running a business can feel exhausting at times! There is the endless task of trying to be more productive, more efficient, and the balancing act of not spending too much money. Many business owners try to handle everything in-house to save a few dollars. After all, it can be daunting to pay for a service that you may think you can do yourself. One of the most common tasks that people try to handle themselves is their bookkeeping. In reality, outsourcing your bookkeeping will often save you money, and it will definitely save you time. In business, time and money are two of your most valuable resources. With something as important as your finances, you don’t want to take your chances. Leaving it to a professional gives you peace of mind that everything will be done efficiently and correctly. So, is hiring a bookkeeper the right decision for your business? 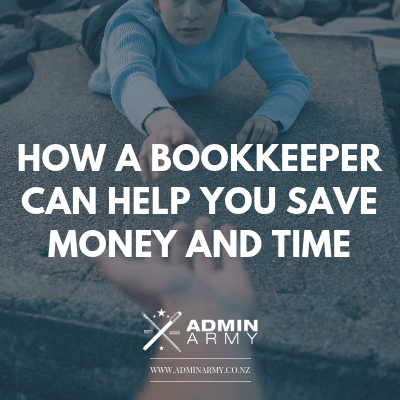 Read on to find out how having a bookkeeper could not only save money and time for your business, but they can also change your business life for good. In a small business, a financial miscalculation can either be annoying or turn into a disaster. If you are handling the books yourself without training and experience, it is all too easy to slip up. On top of that, you more than likely don’t have the time to really focus on it. This lack of focus can result in you paying your bills late or forgetting to follow up on an unpaid invoice. A professional bookkeeper knows their systems inside out. They are dedicated to the detail and can avoid any costly errors. Using a bookkeeper means your financial records and accounts stay reconciled and up to date. This is important because your business relies heavily on this information to make both short and long term decisions. If you are basing your business planning on inaccurate data, you are going to lose money and time. New flash: tax time doesn’t have to be stressful! If your books are accurate and up to date, then tax time is a breeze. You won’t have to spend enormous amounts of money on an accountant to tidy up your records before they can get stuck into the tax details. Your bookkeeper knows their way around the relevant tax incentives and deductions for your industry (which change periodically), so they will ensure you don’t pay more tax than you need to. They will save you money, time, and a massive headache. Not a fan of numbers? Luckily, your bookkeeper is. They live and breathe numbers, and have figured out exactly which tools are the most efficient. If you attempt to do your own bookkeeping, you will have to spend time figuring out the software, learning how everything works, and inputting your figures daily. A bookkeeper can do the same job in a fraction of the time as they have all of the efficiencies in place already. It is hard to keep on top of all the daily tasks when your to-do list is as long as your arm. Do you have time to chase up clients that are late in paying, or reconcile all of those transactions in your bank account? Probably not. However, your bookkeeper makes this a priority, because late payments (incoming or outgoing) and unreconciled amounts mess up your accounts. Your bookkeeper takes these jobs off your hands, so that you can focus on what you do best. Are you ready to save money and time in your business? Then we are ready to help you do it. Here at Admin Army, we have a team of expert bookkeepers ready to fight for your business and tackle those front line jobs. Get in touch with us today to find out how we can help you nail those finances. Previous readingHow Much Time Are You Wasting Every Week?